Blooming Rabbit, inhabits in Isabel Valley, is one of the favourite pets of God of Youth Vivian. Blooming Rabbit is gentle and fond of nectar. Every year, people dress up Blooming Rabbit as mascots to express respect and gratitude to the God of Youth Vivian. Show your lucky in Wheel of Fortune! Finishing some daily tasks to win WoF Lottery Tickets and spin for massive rewards. 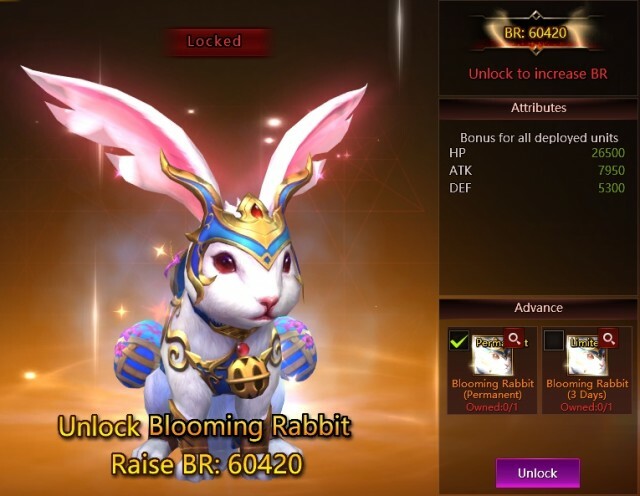 This is the best chance to win limited Mount Blooming Rabbit. Event time: April 14th to April 16th. Blooming Rabbit a lovely Mount is coming at this Wheel of Fortune! Surrounded by colorful eggs, Blooming Rabbit is the cutest Mount in Grace Continent. Once player unlock, it will bring over 60K BR and a perfect new look of Mount. This is the best chance to get massive rewards and win Blooming Rabbit! Come join us and show your lucky in Wheel of Fortune. During the event, players can get latest Mount by meeting certain requirements! >>After finish some certain tasks, players can get WoF Lottery Tickets to use in Normal Mode and get rewards include Blooming Rabbit (3 days). >>Players can also use Topaz and spin the Wheel in Elite Mode, it can get Blooming Rabbit for permanent. >>After meeting some certain requirements, players can use lucky coins to redeem Blooming Rabbit for permanent.